In this guide I will go over details on how to start your first island. These steps will help you keep a positive income as well as keep your park safe. I will give you tips and tricks or well just tips really on how to keep the money flowing in a positive direction. How to Get the Cash for New Islands (Easy Way). W - Moves the screen forward. A - Moves the screen to the left. S - Moves the screen backwards. D - Moves the screen to the right. Q - Rotates the screen Counter Clockwise. E - Rotates the screen Clockwise. Pg Dn - Scrolls Out. This can all be done with the mouse by either Holding Right Click and moving the mouse or just moving your mouse to the edge of the map. As well as holding the Mouse Wheel down and moving to move rotate the camera. Scrolling the Mouse Wheel zooms in and out. Z and X Rotates the Buildings your placing Space locks the buildings to a snap point (Note it rotates the building 90 Degrees for every z or x press. First you can open the Ranger Menu and the ACU menu at any time as long as they are placed by pressing. While controlling the vehicles it uses WASD to move. R swaps to the gun. F on the Jeep changes to the Camera. This is the basics you will need to know to play the game. As soon as you have started a new game you will be given a small cutsceen introducing you to the island. After this is done just follow the small Tutorial. The First step is to place the Hammond Creation Lab. I suggest doing this as far to the side of the area you are given as possible. This will leave a space large enough for a Viewing Area which will be added later. Follow the Tutorial and create your first dinosaur. Enjoy the Cutsceen of your dino coming out after your done you will pick a Contract. I am not gonna lie its best to take Security first Follow their instructions and you will find out exactly why this is. 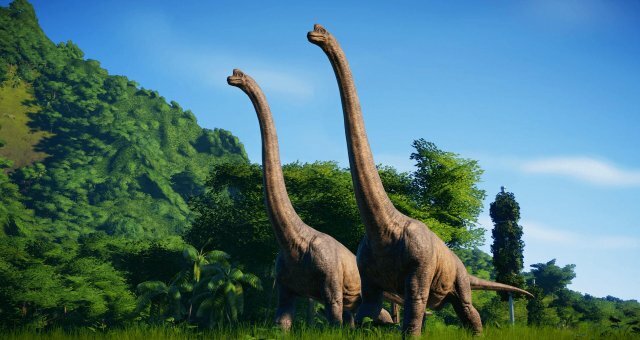 Spoiler: Your releasing a dino into the park which if you have a ton of people already there is serious risk of injury which will put you in a bit of a pickle as your will be hemoraging money. Follow along and after your done you can continue on as normal. This should be the only one you have to worry about. Around now or even before make sure you place down a Feeder in your pen. If you do not recieve any contracts you may request one in the control room under contracts. this should get your moving along. Now here is the big thing to make you get money and I can not stress this enough. Once you have a dino or 2 and have completed the Security Contract go into you Enclosures tab and place a Viewing Gallery beside the Hammond Creation Lab. Now you should have people coming in regularly. Your Profits will rise as you raise more dinos and as long as you make sure you don't stress your dinos you shouldn't have any problems. This will give you a basic run down of how to make sure your animals are happy and don't break anything. If you click on one of your dinos and press R you will get the status of that dino. we will go over this list to make sure your dinos are constanly happy. Health: The amount of health they have. Food: The amount of Food they have, Put a feeder down of the corrosponding type. Water: The amount of water they have. as long as there is a pond they will drink. These three are easy to keep up as long as you have a Feeder and a small pool of water in the pen with them. Comfort: This is a very important stat to keep an eye on. If it gets to low the animal will go on a rampage and attempt to break out of the encloser and attack park goers. All the below stats are what affects Comfort. Grassland: This is the ammount of open area the pen has available. Forest: This is the amount of Trees in the area. Population: This represents ALL the different Dinos you have in the pen so keep in mind how many. Social: This represents how many of that type of Dino you can have. Note some dinos require more than just 1 as soon as they pop out. This means that their Comfort it droping instantly upon release. Make sure you can make enough so that they don't rampage. If any of these gets into the red the Comfort will start to drop. WHen the comfort hits the red zone your dino will go on a rampage break out of the pen and go wild on the tourists. As long as you keep an eye on these bars you won't have to worry about any of the dinos going on a rampage.